1 Heat the oil in a pan and cook the chilli, garlic and onion for 1 minute. 2 Add tiger prawns to the pan and cook until they turn pink, 2-3 minutes. 3 Cook broccoli in boiling water for 3-4 minutes adding spinach at end until just wilted. 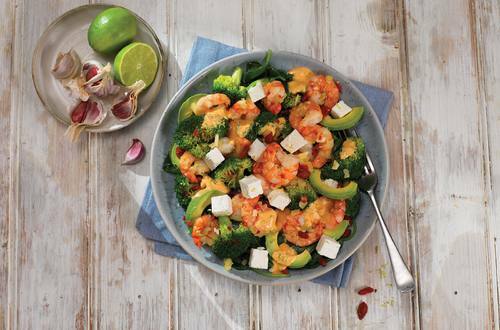 4 Mix prawns with paprika, red pepper, avocado, zest and juice of lime and Hellmann’s Thousand Island Dressing. 5 Spoon the veggies onto serving plate and top with the prawn mix. Sprinkle with feta cheese and goji berries if used.